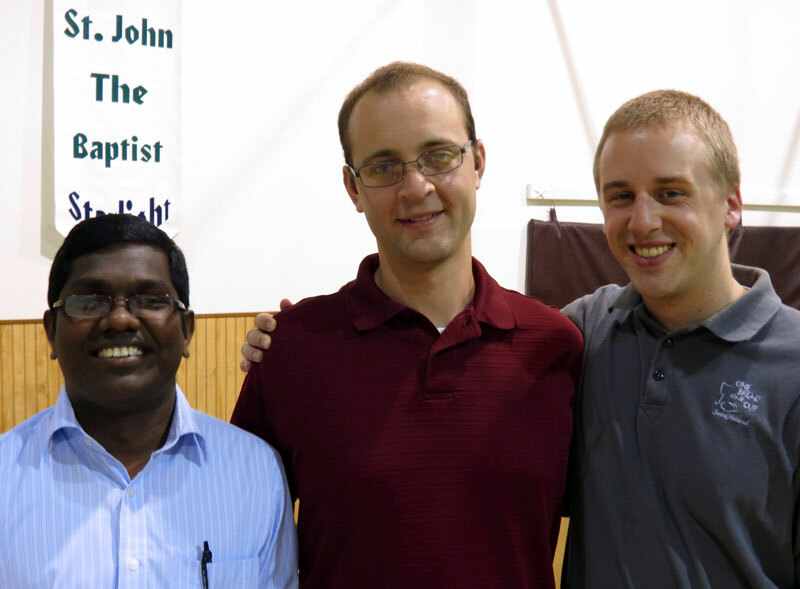 Seminarians Xavier Raj, from left, Michael Keucher and Kyle Rodden pose for a photo at St. John the Baptist Parish in Starlight on Aug. 15 during the annual archdiocesan seminarian pilgrimage. All three seminarians receive their priestly formation at Saint Meinrad Seminary and School of Theology in St. Meinrad. Raj is a member of St. Jude Parish in Indianapolis. Keucher is a member of St. Charles Borromeo Parish in Bloomington. Rodden is a member of Most Sacred Heart of Jesus Parish in Jeffersonville. (Submitted photo) Click for a larger version. Each year prior to the start of the academic year, the seminarians of the Archdiocese of Indianapolis take a pilgrimage to visit parishes in central and southern Indiana. Father Eric Johnson, archdiocesan vocations director, celebrated Mass with them for the Solemnity of the Assumption of the Blessed Virgin Mary at the new St. Mary-of-the-Knobs Church in Floyd County, which was dedicated on March 25. Later in the day, the seminarians visited St. John the Baptist Parish in Starlight. The archdiocese’s seminarians receive their priestly formation at Bishop Simon Bruté College Seminary in Indianapolis, Saint Meinrad Seminary and School of Theology in St. Meinrad, and Pontifical North American College in Rome.